Root canals are a common problem and are performed with minimum discomfort to the patient. Often in the past, if you had a diseased nerve, you would probably lose that tooth. Nowadays with the advancements in dentistry it is now very easy to save that tooth using a special procedure called a root canal. Root canals are a simple procedure and normally involve one to three visits. The most important part is that a root canal can save your tooth and your smile. The nerve of the tooth is not essential to the tooth’s health and function, therefore after the tooth has emerged through the gums, its only function from hereon is sensory – whether something is hot or cold. Therefore because of this the absence of the nerve does not affect the day to day functioning of the tooth. 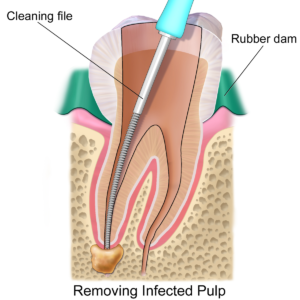 A cracked tooth or a tooth with a deep cavity will allow the becteria to enter the pulp tissue. This can cause an infection inside the tooth. It is at this point that an abcess may form. If this infected tissue is not removed it will cause pain and swelling which in turn will not only affect your jawbone but is detrimental to your health. It is at this point when your tooth is left untreated that your tooth may need to be removed. HOW DO I KNOW IF I NEED A ROOT CANAL? WHAT ARE THE SIGNS? Unfortunately, teeth that require a root canal are not always painful and the signs that you may need a root canal include symptoms such as severe toothache or pain when you apply pressure to the area or sensitivity when drinking hot or cold drinks. This can cause a temporary discoloration of the tooth and swelling or tenderness to the nearby gums. It is at this point that it is time to contact your dentist. WHAT HAPPENS DURING THE PROCEDURE FOR A ROOT CANAL? It involves one to three visits. The endodontist or general dentist will remove the affected tissue. The dentist will then clean the interior of the tooth and then seal it permanently. The dentist then fills it with a composite material. If the case is such that your tooth has extensive decay then your doctor will suggest placing a crown on your tooth in order to strengthen and protect it from breakage. After this, as long as you continue to care for your teeth and gums with regular flossing and brushing and visit your dentist regularly, the tooth will last you a lifetime. TO FIND OUT IF YOU MIGHT BE IN NEED OF A ROOT CANAL, SIMPLY SCHEDULE AN APPOINTMENT FOR CONSULTATION ON OUR WEBSITE OR BY CALLING US DIRECTLY AT (718)897-3434.